What a wonderful Mother’s Day weekend. It has been a while since I have been to my parents’ house, and even longer since I have been able to cook all weekend. Friday night, after coming home from NY, my mother made some exotic Indian fare — millet wheat roti, okra and yellow lentil soup. Very delicious. I learned how to make roti as well, although my mother is considerably better at it than I. While cleaning the dishes, she was telling me about an Almond cake she made earlier in the week that had no flour and no (explicit) sugar. But she said it came out a bit flat (later I learned it was because she got lazy and didn’t whip the egg whites! =P). I decided to whip up a batch then and there. The recipe is here at Anja’s Food 4 Thought. I think it turned out wonderfully. 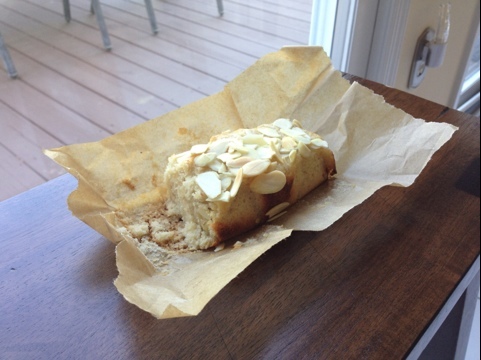 I only made a few small changes: added 1/4 tsp of vanilla essence and orange essence and instead of toasting and grinding almonds, I used almond powder which resulted in a finer (cake-like) texture, but no toasted almond flavor. More deliciousness after the jump! Truly delicious scallops…possibly the best I’ve eaten (and most probably the quality of Whole Foods fresh bay scallops and a lucky perfect sear than anything else). Pretty standard preparation for the scallops…Quick rinse, patted dry with paper towels. Seasoned with salt and pepper on both sides. Non-stick pan with canola oil (I would have used grapeseed if I had it on hand) heated on medium-high until the oil starts shimmering. Then I took a tablespoon of butter and cubed it and tossed the cubes into the pan. Right after the butter stopped foaming I added the scallops. 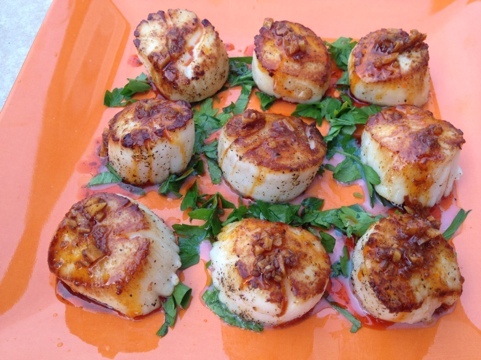 Since they were medium sized (9 scallops in a pound), they took about 3-4 minutes on the first side and then 2 minutes on the second side and voila! The fun in this dish was making the spice oil…I will have to add the recipe later, but basically it was grinding some fresh spices (black peppercorns, cumin, salt, paprika), then heating them in oil until it just starts to bubble for 2 minutes, then removing it from the heat and pouring it over some fresh lemon zest and minced garlic. After cooling add some lemon juice and salt to taste. Served on a bed of chopped flat leaf parsely and cilantro, this dish was sublime. I’d like to think my cooking has become more refined over time. I think my strongest case would be making homemade pasta. 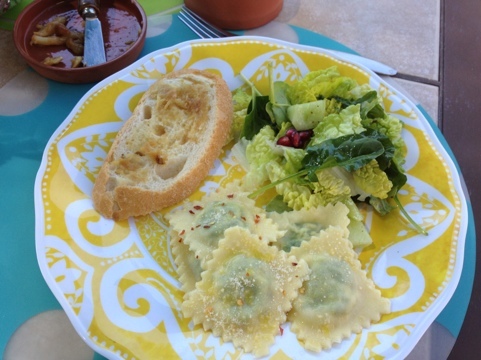 After traveling to Italy last spring and taking a cooking class, I was hooked to fresh pasta. You just CANNOT compare fresh pasta with dried pasta. I was shopping with the family this weekend and we walked into a Williams-Sonoma (overpriced, I know, but whatever) and I finally just paid up and bought a pasta machine. 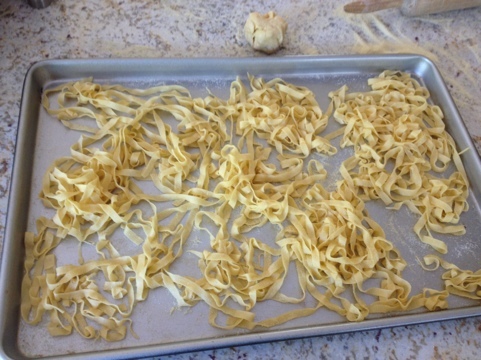 The pasta was easy enough to make…I’ll go into detail in another post, but the sauce was a lot of fun. 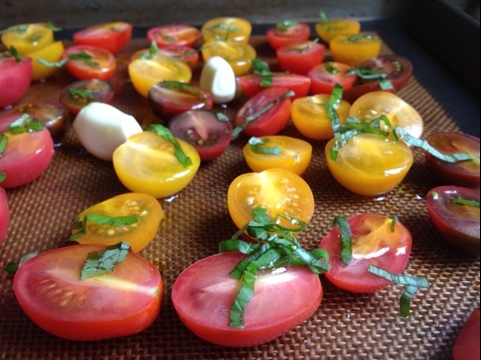 I bought a carton of heirloom tomatoes, halved them, drizzled with some nice EVOO and some basil chiffonade and threw them into a 225F oven for 3 hours. Yes 3 hours. Seriously? Yes. Trust me, it was worth it. 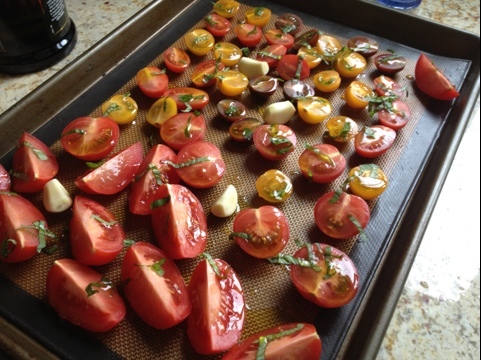 I took everything off the baking sheet (even the drippings) and lightly crushed the tomatoes with a spoon before adding more fresh basil and a little salt/pepper. 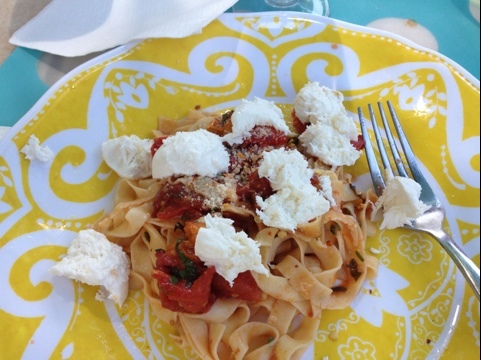 Tossing the fresh fettucini in this sauce and topping with fresh chunks of mozzarella was heaven. MUST try this a lot more in the summer. 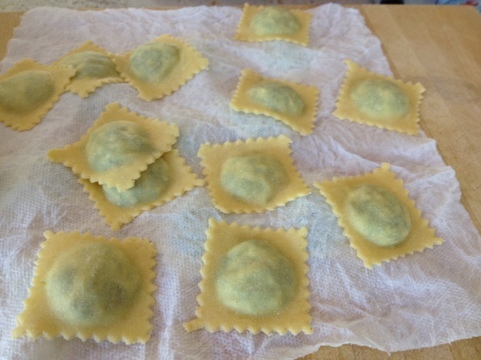 We had a few extra hands in the house, so we made another batch of pasta dough and used the ravioli press we bought in Italy last spring to push out some fresh ravioli. We didn’t really feel like going to the store and buying ricotta since making these was an afterthought, so my mother had a great idea to just throw random stuff inside. We ended up using some finely chopped spinach, arugula, parmesan, pecorino, mozzarella, nutmeg, salt, pepper, egg and a touch of sour cream to help bind the filling. Topped with some fresh olive oil, parmesan and pepper.